Here are some tips to help you find the cheapest replacement RV mirrors for your Class A or Class C motorhome. As soon as you sit in the driver’s seat of a Class A or Class C motorhome, the first thing you may notice is its size. Some of them can be quite intimidating, when you think about maneuvering around on a single-lane campground road, or a small side street. Your mirrors can be your co-pilot in situations just like these. We’re going to explore not only where, but how, to find replacement RV mirrors, and how to do so on a tight budget. We will also give you some tips on practicing safe driving, using your mirrors. You do not have to be a truck driver to know that you need to learn how to use the mirrors on your motorhome. Every motorhome has them. They can save you a lot of time, and costly mistakes, by using them properly, and by knowing what is going on around you at all times. Their purpose is to keep you, the driver, looking forward, while at the same time giving you a view down the sides, and to the rear, of your rig. What class motorhome do you have? Class A motorhomes are usually the largest, and are commonly distinguished by the large, bus-like front. Class C motorhomes are built on a van or truck chassis, with an attached cab. These are also known as the “cab-over” motorhome. 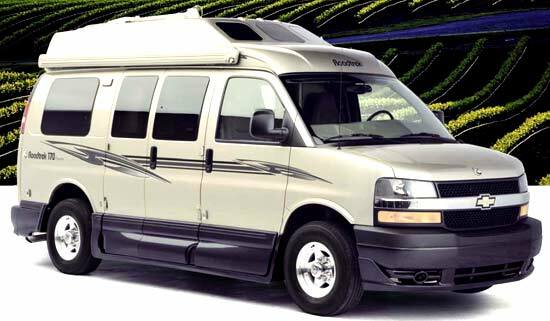 Class B motorhomes are the smallest, and are built using a cargo van with a raised roof. These rarely have extended sides, are not very long, and normal car mirrors work just fine on them. 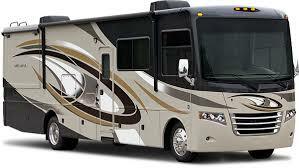 What is the make, model and year of your motorhome? 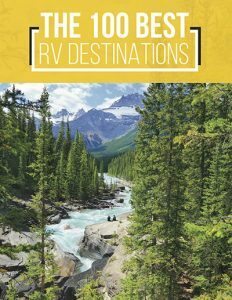 You should have received this information when you purchased your RV. If not, it is usually printed somewhere on the RV, maybe in a closet. Also, for some Class C’s, you will need to know what chassis it is built on: for example, Ford, GMC, Chevrolet, etc. What is the length of the mirror arm? This is something you will need to know. Note exception: If your mirrors do not have an arm (meaning the base and arm appear to be one piece), you will not need this measurement. What is the color of your mirror? Most RV mirrors for motorhomes come in black, white, or chrome. If they are any other color, you may have to go to your manufacturer. These may be custom-painted mirrors. What options do you have on your mirrors? Mirrors come with several different options. With manual adjustments, you will need to adjust the mirror outside the RV, with your hand. Remote adjustments are done with a switch, inside your RV cab. Another option is heated mirrors, for use in cold weather. Some mirrors have turn-signal lights, or arrows that light up, when you use your turn signal. There are some mirrors that will close or fold inwards, while other mirrors are stationary. 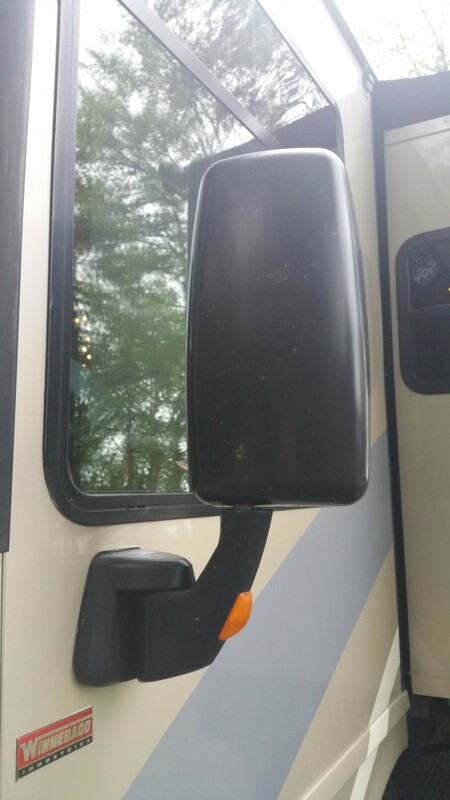 Now, let’s take a look at a few places to find RV motorhome mirrors. 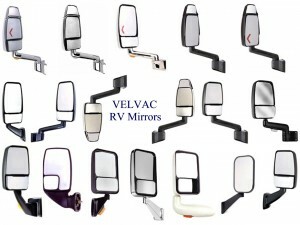 Many RV replacement parts companies will have mirrors. TruckChamp.com is one that, along with Ebay and Amazon, often carries several models of RV replacement mirrors. Velvac is another, and is a leader in the manufacturing of mirrors, for both Class A and Class C motorhomes. Their website offers a great selection, and you can search by make, model, and year, or through their photo gallery. They have friendly and knowledgeable staff, to help simplify ordering, as well as to answer any questions. Where can you find the cheapest replacement mirrors for your Class A or Class C motorhome? 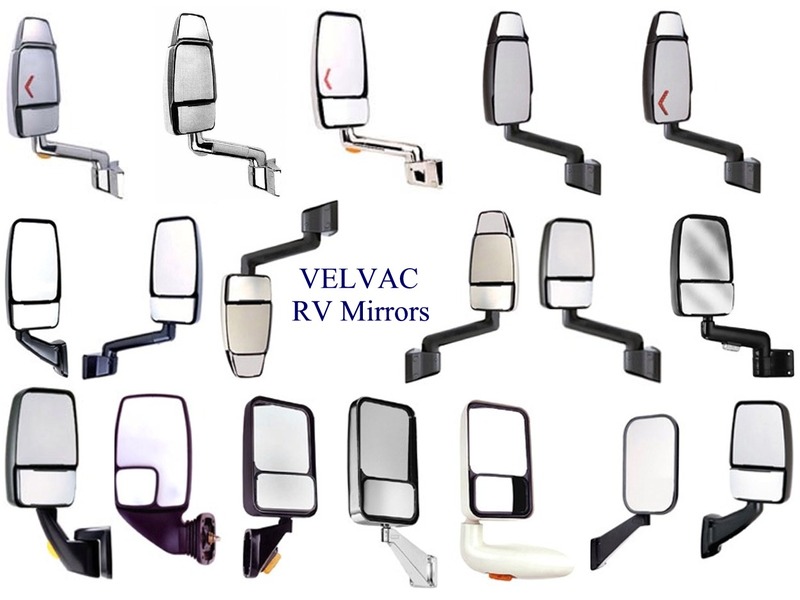 If you have taken any time to look for RV replacement mirrors, you know they can be a costly part to replace. By taking the time to search, you can save some money, rather than paying retail. You may want to consider buying used parts. One place to look is eBay. It has a vast selection of mirrors of all types, shapes, and sizes for your RV mirror needs. There are many RV-parts places that sell parts from used RVs, and you could find a great deal, on just the kind you are looking for. Off-brands, if you can find them, will normally be priced less than major brands, and in most cases, will be comparable to their name-brand cousins. You can choose mirrors with fewer options, in order to save money. For example, look for manual adjustment, instead of remote adjustment, or go without lighted (or heated) mirrors for a cheaper option. Protecting your mirrors, with mirror covers, is a great way to help you save money in the future, by allowing your mirrors to last longer. 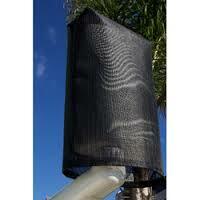 These covers will protect them from dirt, grime, and harmful sun rays. You can find these at RVQUICKSHADES.COM, or at most places where mirrors are sold. In recap, finding the cheapest replacement mirrors for your motorhome may be a little time-consuming. However, in exchange for doing a little homework, you can save a fair amount of money, and it is worth it. The following tips will help you use your mirrors. Practice safe driving in your RV, and protect your investment from avoidable accidents! Use those mirrors– Your mirrors provide a way for you to safely see what is going on around you while you are driving. Knowing what is in front of you, is just as important as what is behind you. Not only are the side mirrors necessary, but having a rear view mirror is helpful as well. You may only be able to see inside, to the back of your RV, but when you turn a curve, and something falls out and crashes to the floor, a quick glance up into your mirror is far better than turning around in your seat. 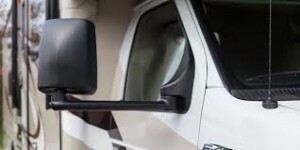 Fold them in– If you have mirrors that are able to fold inward, towards the cab of your motorhome, you will want to fold them in while not in use, to protect the, otherwise protruding, mirrors from getting caught on things. Take a minute– When it comes apparent that you do not have a clear view of your surroundings, while trying to back into tight quarters, just stop and evaluate the situation. While it is easy to get in a hurry, if you do not take an extra minute to determine the best way to maneuver, it will often result in a careless mistake, and it could end up being a costly one. Don’t count on your backup cameras– Most of them are pointed down, and don’t give you a broad enough picture of exactly what is behind you. Don’t get me wrong, they are good to use, but do not rely on them solely. Be aware of not only objects on the ground, but also branches from low hanging trees, overhangs on buildings, or possibly low-hung power lines. All these are things that your RV could snag. 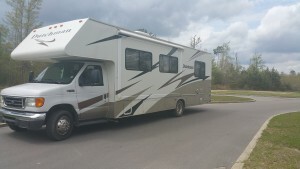 Practice makes perfect– If you are not used to driving a motorhome of any size, it is a good idea to go to a parking lot to practice, preferably one that is closed. Bring some cones, or even empty milk jugs, to set out. Practice using your mirrors to back between the cones, as if it were an RV pad, at a campground. Do this until you are comfortable with it, and are able to do it without hitting any cones. Remember, you want to protect your investment, so take your time while practicing, and get the most out of using your RV mirrors. 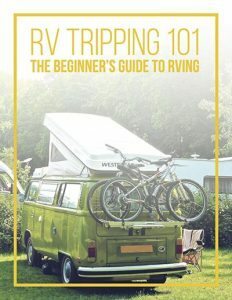 If you found this article helpful to you in finding your RV replacement mirrors, and appreciated the tips for using them, please consider sharing.